The first representation took place yesterday afternoon. Despite the somewhat threatening aspect of the weather there was a vast audience, amongst whom were many of the leading residents of Manchester, Salford, and the neighbourhood. In the centre of the arena is a small platform set apart for the "orator," who introduces and explains the various "episodes." This office, so ably filled formerly by Mr. Richmond, is now held by Mr. H. M. Clifford, who has a very powerful voice. 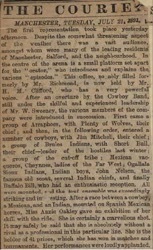 After an overture by the Cowboy Band, still under the skilful and experienced leadership of Mr. W. Sweeney, the various members of the company were introduced in succession. 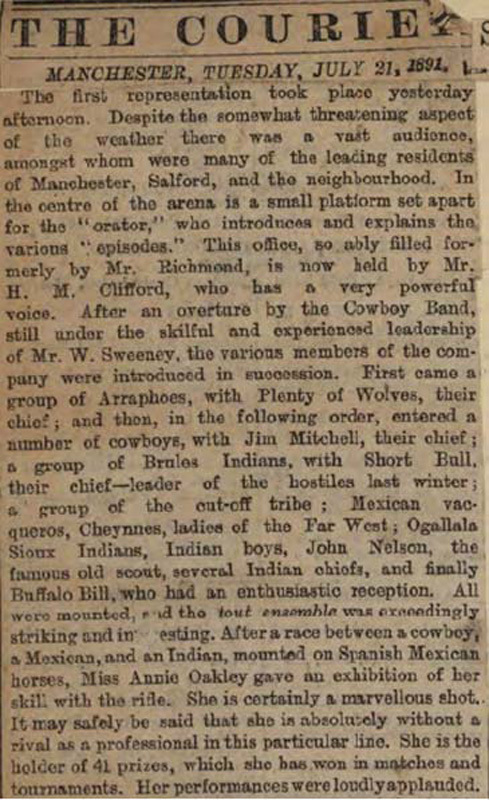 First came a group of Arraphoes, with Plenty of Wolves, their chief; and then, in the following order, entered a number of cowboys, with Jim Mitchell, their chief; a group of Brules Indians, with Short Bull, their chief—leader of the hostiles last winter; a group of the cut-off tribe; Mexican vacqueros, Cheynnes, ladies of the Far West; Ogallala Sioux Indians, Indian boys, John Nelson, the famous old scout, several Indian Chiefs, and finally Buffalo Bill, who had an enthusiastic reception. All were mounted, and the tout ensemble was exceedingly striking and interesting. After a race between a cowboy, a Mexican, and an Indian, mounted on Spanish Mexican horses, Miss Annie Oakley gave an exhibition of her skill with the rifle. She is certainly a marvellous shot. It may safely be said that she is absolutely without a rival as a professional in this particular line. She is the holder of 41 prizes, which she has won in matches and tournaments. Her performances were loudly applauded. 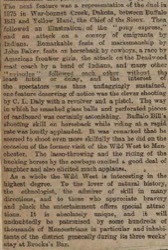 The next feature was a representation of the duel in 1875 in War-bonnet Creek, Dakota, between Buffalo Bill and Yellow Hand, the Chief of the Sioux. Then followed an illustration of the "pony express," and an attack of a convoy of emigrants by Indians. Remarkable feats of marksmanship by John Baker, feats on horseback by cowboys, a race by American frontier girls, the attack on the Deadwood mail coach by a band of Indians, and many other "episodes" followed each other without the least hitch or delay, and the interest of the spectators was thus unflaggingly sustained, one feature deserving of notice was the clever shooting by C. L. Daly with a revolver and a pistol. The way in which he smashed glass balls and perforated pieces of cardboard was certainly astonishing. 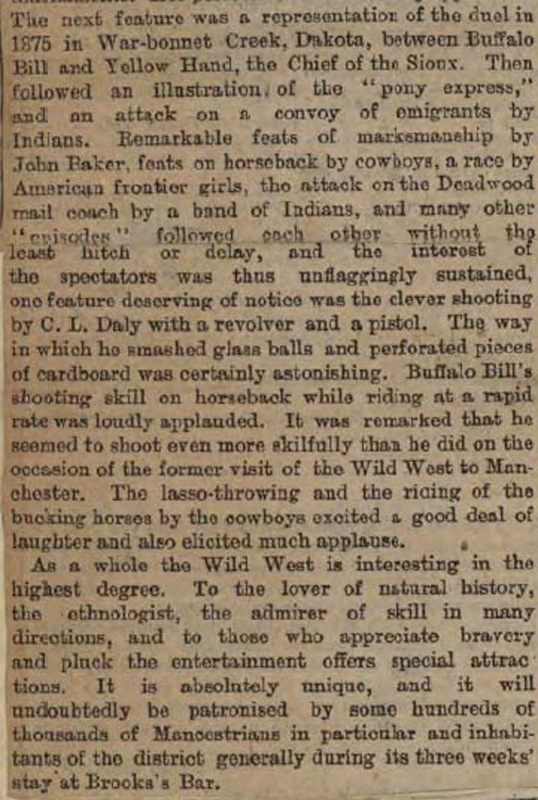 Buffalo Bill's shooting skill on horseback while riding at a rapid rate was loudly applauded. It was remarked that he seemed to shoot even more skilfully than he did on the occasion of the former visit of the Wild West to Manchester. The lasso-throwing and the riding of the bucking horses by the cowboys excited a good deal of laughter and also elicited much applause. As a whole the Wild West is interesting in the highest degree. To the lover of natural history, the ethnologist, the admirer of skill in many directions, and to those who appreciate bravery and pluck the entertainment offers special attractions. It is absolutely unique, and it will undoubtedly be patronised by some hundreds of thousands of Mancestrians in particular and inhabitants of the district generally during its three weeks' stay at Brooks's Bar.